Henry sent Cromwell to death on July 28th, 1540. Though Henry had spoken angrily and contemptuously of him and had shut his ears to cries for mercy, his mind was too good not to see that there was no real guilt against himself: the thought of execution was disturbing. It was, of course, the outcome of circumstances which he himself had created and by which he had profited hugely. But moral bookkeeping was a tortuous task with Henry. While he had yielded to the death struggle between Cromwell and Norfolk, and now sidled away from the Protestants, he still nursed a hidden grudge against those to whom he was yielding. To please the Seymours, if nothing else, he kept Cromwell's son Gregory in fortune, and he retained his nephew Richard in his Privy Chamber. Thus, in his own heart, he disputed the capital sentence of which at the same time he proposed to enjoy the fruits. One of these fruits was the new wedding. With his need for benumbing his nerves, Henry arranged it for the day that Cromwell was to be beheaded. As that stout citizen, black brow and gray face, set out on the road from, the Tower to Tyburn, an animal on the runway to the cleaver, his master Henry was at Oatlands, a private mansion not twenty miles away, to be united to his fresh young bride. The rose without a thorn-that was the tribute Henry had inscribed on one of the countless jewels he gave to Catherine. And as he gazed at his new choice, his eyes revealed that this was a union unlike the others. Catherine of Aragon had been the serious matron whom he perforce respected: Elizabeth Blount had been a ripe young goddess who submitted to him: Anne had been hard ambitiousness: Jane had been the perfect demure consort. There had been other affairs, like Mary Boleyn, casual and capricious. But this new choice was electric. "The King's Highness did cast a fantasy to Catherine Howard the first time that ever his Grace saw her." And all he had heard of her-from her grandmother the old Duchess, from her companions, from Lord William Howard-made him value the "jewel for womanhood" he had luckily lighted on. He had himself chosen her device, "No other will but his," and this possessiveness beamed from him. He was like a collector who has brought home a treasure in faience (decorative earthenware), not the most precious material but the gayest and the most vivid. "He is so amorous of her he cannot treat her well enough." He could not, in public or in private, keep his hands off his acquisition. "More than he did the others," he affectionately caressed her. The object of these caresses was physically the rose without thorns which Henry desired. She was very small and well-rounded with a delightful open expression, vivacious, graceful, quick to dance, giddy, gay, imperious. She had dressed herself and her ladies in the French style, and her hazel eyes and auburn hair gave her the coquettish brightness that enchanted and elated her royal husband. But she was scarcely the delightful toy that Henry surmised. Six years younger than his daughter Mary, she touched in him the vibrant double chord of lover and protector: he saw her in his own amplitude and her submissive inexperience. But she could hardly be expected to share this glamorous autumnal haze. A rose though she was to him, she was far more like a plump and fleet young doe who turns on a rich pasture her vernal eyes. She could respect this corpulent personage, but he was less a fellow being than a glorious circumstance that had endowed and enveloped her. She could not really think of her magnate as that marvelous creature, a man. Catherine was a juvenile delinquent. Though she had not been exposed, like her cousin, Anne Boleyn, to the licentious influences of the French, she had contrived without them to travel rather fast at home. In the great establishment over which the wealthy old Duchess of Norfolk presided, there were enough girls to constitute a boarding school, but it was a boarding school of full-blooded and high-spirited youngsters with no religious training, no lessons, no mental interests, no discipline. When the old lady was safely in bed in the evening, the girls' dormitory (the gentlewomen's chamber, as they called it) was artfully opened by a key that Catherine had stolen, and into her own chamber came "the light young men." These were favored kinsmen or poor relations, attached to this establishment as pages or gentlemen. The general level, naturally, was set by the older couple or two, whose presence was buzzed among the dozing gentlewomen. The ducal youths brought delicacies with them from the table. They had exciting midnight suppers, and as the nights lengthened into indolence and luxuriant silence the young men lay on the beds with the girls and their attendants, in the medley of an emotional hothouse. It was what older people call "dangerous" but for warm and amorous young people with no idea in life but their adventure, it must have been throbbing and wildly pleasant. An immense amount of love-making, bickering, whispering, gift giving, promising and reproaching went on in these covert visits to the dormitory while the old Duchess snored gently upstairs, probably dreaming about her stepson Thomas and his similar behavior with the laundress Bess Holland. Romance was in the air. Margaret Douglas's affair with young Howard was romantic. So was Anne Boleyn's with Thomas Wyatt. So was young Surrey's with Geraldine. It was the age of a dethroned Pope and the Heptameron. The effect on Catherine, who was strong and adventurous but neglected and illiterate, was to plunge her into love at thirteen. It had begun before these parties. A young man, Manox, was appointed with another youth to teach her the spinet; the radiant little girl enamored him and he managed to see her alone and to caress her. The Duchess came on them: she gave Catherine a blow and drove away her teacher. Soon this first affair went out of the girl's mind with the advent of Francis Derham, a young gentleman "of a poor house" related to the Norfolks. He was one of the leading spirits in the midnight parties. He began by lying on bed with a chaperoned Catherine, in his doublet and hose, but he and Catherine soon fell in love. From hose and doublet between sheets to the naked bed was a certain transition. Their affair stretched from fourteen or fifteen to eighteen, a rainbow of delight. They excused their hot pulses by talking of marriage and they were intimate in the huddled and feverish fashion of rather promiscuous, desperately serious, highly lascivious and intensely passionate youth. Manox was a cad, however, and his failure with Catherine induced him to concoct a letter to the Duchess, which he piously laid in her pew. It advised her to swoop down on the dormitory, late at night. Acting on this advice, she did storm the gentlewomen's chamber anti discovered the group gorging on dainties. She later found Catherine and Derham "in arms kissing." To aim a blow at Derham, to strike at the girl, to hit Joan Bulmer who was standing by, and to show how offended she felt, seemed the limit of the Duchess's resources as a mother superior. Lord William was more furious with Manox than with his niece. He gave the knave a piece of his mind, while the tittle-tattle he ignored. "What mad wenches! Can you not be merry among yourselves but you must then fall out?" He did not believe because Derham "used to haunt her chamber nightly" that the misrule was tragic. The old lady's sole weapon was the testy grumble of a toothless dowager. "I warrant you if you seek him in Catherine Howard's chamber ye shall find him there." When, on Henry's suddenly favoring the girl, who seemed charged with mischief and vivacity, young Derham cleared out to Ireland, to try his hand at piracy, the old lady shook her head; and when he returned she half-approvingly pointed him out, "This, is he that ran into Ireland for the Queen's sake." But the young pirate's hold, by that time, had been broken. Shortly before Catherine was appropriated by Henry, she had gone from the Duchess at Lambeth to reside at court where she dashed into place among the brilliant water flies. The girl's own mother had been Jocosa (Joyce) Culpeper of Kent, and one of Henry's brightest favorites was a youth called Thomas Culpeper. It was Thomas who looked after Henry's leg, perhaps, to see that the physician's orders were carried out. He had slept in Henry's huge bed from a boy, upheaved his master in the morning, amused and undertook commissions for him, and was one of the most privileged gentlemen of the Privy Chamber. Henry heaped him with stewardships and sinecures and tossed him an abbey, which indicates that the young dandy had made himself agreeable. One extremely ugly story was hinted, but Catherine Howard did not see a ruffian in Culpeper. She saw a man of her own people, her own age, her own inclination. When she was waiting on Anne of Cleves or Princess Mary, she had made up her mind, quite frankly, to "try him." Her marriage to Henry brought her higher and yet nearer to Henry's "compagnon de lit." On the edge of Henry's vision, there may have been a flicker of all these "doings." But he had sought guaranties that Catherine was as good as she was beautiful: the Howards warmly assured him that she was irreproachable. She was reputed for all the freshness that a man of Henry's age would relish. They "commended her pure and honest conditions." And the old Duchess who had ridden with Anne Boleyn at her coronation, comforted herself by mumbling of Catherine, "She cannot die for what was done before!" The girl herself, pursued around and through the flame, had singed her wings, but she was of sweet and abundant nature, of invigorating temper, and of the impulse unusual among the Howards to give herself rather than to acquire. The love of joy was in her. The past, however, is hard to shed in a blackmailing world. Joan Bulmer had not hesitated, with demure but meaningful insistence, to ask that she should be brought to court. Young Derham soon came back from ravishing the Irish coast, and, warned by Catherine to "take heed what words you speak," was made a swaggering usher of the chamber to the Queen. Meanwhile the whole Howard family, her two young brothers and her two young sisters, went up in fortune and favor. Catherine could hail the row of them from the royal box, and give them the reversion of bounty, and buoy up the whole young indigent tribe. Henry had. to repress her a little. But this profusion of her destiny she seems to have longed to share, and her impulses were generous not merely for the young Howards and the Bayntons and the Arundels. She passed on things Henry gave her - dogs, jewels, odd things - to such recipients as Anne of Cleves. Henry watched this exuberance with the internal groan of a man who has become abstemious in these matters. But she even had it in her heart to ameliorate the human havoc that he caused through his vindictiveness. She was sensual in the grand English pre-Puritan sense - "endowed with feeling." Rather the contrary, that is to say, of Henry himself, whose liberality of feeling gave credit with the open hand, and retained the art of legal seizure in the other fist. At forty-nine, as Holbein has preserved him in the superb portrait at Rome, Catherine's bridegroom was a solid Magnifico. Though he shuffled to the altar, obliged as a rule to help himself with a long stave on account of his leg, he presented himself before Bishop Gardiner not as an inert or sagging mass but as a pyramid of defensiveness. There was in the eyes that living twinkle, half-humorous and half-malicious, which may be as kind as dew or as cruel as broken glass. With ears laid back, fists doubled, feet widely splayed, the shoulders built out with velvet and the stomach at anchor, this was a ponderable man, square and imperturbable-until one viewed the face which gave his firmness the impressive mobility that a swiveling gun confers on a bastion. Through long years he had learned to plant himself in his own sort of genial island independence, and, with one eye wide open and the left narrowed, he looked at once crafty and debonair. But this free and good disposition which diffused itself from the unembarrassed Henry was not unlike the insouciance of his feathered bonnet: he could whip it off in an instant, and there, hard and bald, was the high skull, the convergence of all his smooth and receding policies on that one point, the apex of a pyramidal egoism. It was a strange climax for a nation's policy based on great lines of loyalty and obedience. Henry's vigilance for the future was social and political. He had not forgotten Anne of Cleves in his new wedding, and he promptly invited her to join the Queen and himself at supper. Anne came palpitating to Hampton Court, where now, as later, she was received by her young successor with the "utmost kindness." She tried to kneel, but Catherine would not have it. And Henry, who bowed to her and kissed her, used the occasion to file away every existing claim and polish off Anne's final renunciations. If Anne was only too eager to buy peace, having her own life to lead, the King, found others who Contested his will, on the score of religion. Here he became stern. He had seriously considered what, in the way of religious opinion, would be just and proper all around, and he accordingly enacted the right opinion in parliament. Every subsequent retort and disagreement he regarded not as an attack on himself but as an attack on what is just and proper: and it was easy for him to sign death warrants on such high principle. So two days after Cromwell's execution six "doctors" were executed, three hanged, and three lashed to one stake and burnt to death. "It was wonderful," said Marillac, "to see adherents to the two opposing parties dying at the same time, and it gave offense to both. And it was no less strange to hear than horrible to see, for the obstinacy and constancy respectively of both parties, and the perversion of justice of which both parties complained, in that they had never been called to judgment, nor knew why they were condemned. This was a Catholic who poured out an astonishing letter to his King on the essential injustice of these executions. The Protestant, Hilles, wrote to Bullinger in the same strain. They were not justly condemned, he said. "But, to say the truth, people did not inquire much, as it is no new thing to see men hanged, quartered, or beheaded, for one thing or another, sometimes for trifling expressions construed as against the King." "The papist Abel" was one of these victims. He had been locked up years before for denouncing Catherine of Aragon's divorce, and was "almost eaten up by vermin in a filthy prison." Another who suffered was Dr. Barnes, whom Henry had employed as envoy when cultivating the Lutherans but who had since had the temerity to attack Gardiner. These were the last executions for the moment as Henry was flying the plague and had inaugurated group executions out of his new habit of spring-cleaning the Tower. 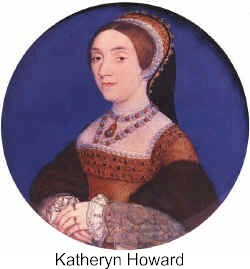 It was a habit that revolted Catherine Howard. With the audacity of her youth, she set herself against her husband's killings. But Luther gave no hope of his contemporary in the pamphlet that he devoted to his friend Barnes. "Das juncker Heintze wit Gott sein und thun was in gelustet." "Squire Harry wishes to he God," he diagnosed the disease, "and to do whatever he pleases." But it was in amiable egoism that Henry enjoyed Catherine Howard. He renewed his youth and set him on the strait and narrow path to beauty. The autumn of 1540 saw him again in the saddle. As three hundred a week were dying of the plague in London, he betook himself with his consort to the country. 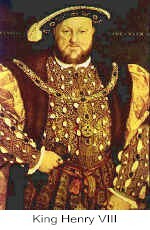 Though it was believed that he had waxen fat, had become "much more corpulent," he saw no reason for ceding to the enemy: with that readiness to dispute sovereignty even in his own flesh, he was bravely determined to give Holbein the lie. "This King," Marillac said by December, "has taken a new rule of living. To rise between five and six, hear mass at seven, and then ride till dinner time which is at ten A.M. He says he feels much better thus in the country than when he resided all winter at his houses at the gates of London." At Woking he was all day in the fields with his hawks; for months nothing had been spoken of "but the chase and banquets to the new Queen." Such a round of gayety brought with it an irruption of high spirits so that commands had to be given "for sober and temperate order in the chamber of presence." But while the Princess Mary held aloof from one whose coming had meant Cromwell's downfall, and while Catherine was offended because "Mary did not treat her with the same respect as her two predecessors," the New Year brought a chance for conciliatory gifts; and no one could deny that Catherine had "completely acquired" her husband's mellowing favor. This was the more flowing because he had sent Gardiner and a hundred gentlemen - "all in grey with great gold chains on their necks" - abroad to woo the Emperor. That melancholy widower was supposedly in the market for a bride and much was being done "to move the Emperor to marry Mary." Toward the French, Henry gradually cooled off. These people "are weary of peace," sneered young Marillac, "and would irritate mankind in order that they may not have a single friend at need." They were preparing, at any rate, for the inevitable breach between Charles and Francis by fortifying Calais and bracing the Scottish border. It was the return to the old policy that Cromwell had combated. Cranmer, in aphelion, did not oppose Henry; rather he chided his German uncle-in-law for the sins of Lutheranism - allowing princes to have concubines and approving of usury and, the bitter pill, permitting the bigamy of Hesse. These signs were not lost on the French, but the French merely re-enforced their smiles. Marguerite kept asking Henry for his picture: she and Francis sent him pasties of wild boar, which had been made and seasoned and "sayed" under their own very eyes.